If you already own Evolution, there is an Evolution: CLIMATE Conversion Kit for sale. It contains everything you need to transform the base Evolution game into Evolution: CLIMATE. Lovely is not the correct word, it’s cutt-throat. You need as a non carnivore to sacrifice cards to become too big to be eaten. The game has countless combinations. You can influence the climate, preferring your species and hurting others. The only negative is the take-that (picking on the weaker ones, me in this case, 3 times in a row, is not fun at all; i even considered walking away. The solution was of course to become instantly bigger, but I learned this lesson too slow. Still the dynamics are off the scale. Highly recommended, this and only this version. The species tracks have holes that keep the blocks in place. The food bonus/malus is very elegant. We didn’t trigger the climate events, but they are there. Requires shuffling a lot and at least 1 round of playing to have the game click. 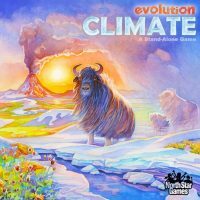 Add a Review for "Evolution: Climate"